My neighbor, who happens to be my good friend, is usually the first person I bounce my quilt ideas off of. She knows nothing about quilting, yet is kind enough to listen to me babble endlessly about this and that related to my latest project. She offers me gentle critics and honest opinions when I ask. For the past year or so she has been bugging me about making a quilt for my own bed. She reminds me often that I have made lots of beautiful quilts for other people, but nothing to beautify my own bedroom. It's true, I've yet to so do. Enter my low volume quilt, a.k.a. "the quilter finally makes herself a quilt" quilt! I have loved this design since first seeing it in the Sunday Morning Quilts book last year. I felt it was the perfect bit of calm and quietness to add to my bedroom. When it came time to chose a backing I went cheapskate. I used a strip of scraps from the front, more vintage sheets, and other low volume pieces I had left over. I don't do pieced backs very often, but I should, as I always love the added interest they give to the quilt. 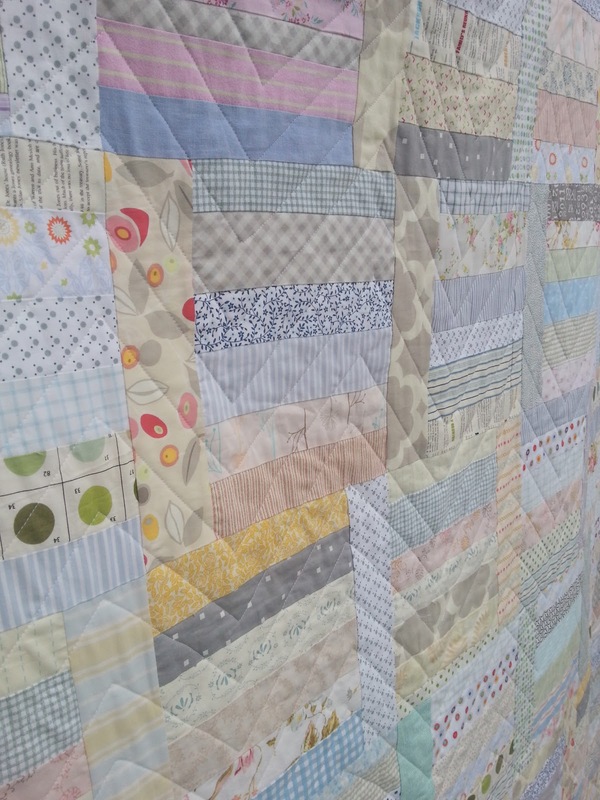 Here is a little close up of the quilting. I didn't have anything specific in mind so I gave my quilter free reign. 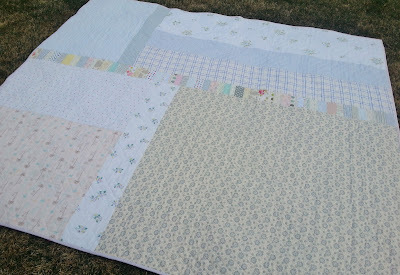 This is a new design she was trying out and I think it looks so fantastic on this quilt! I'm sure this would be a totally doable design on a home machine if you give it a try. 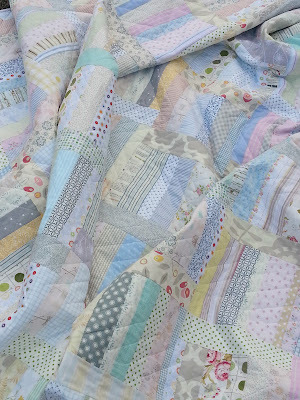 This full view gives you a good look at the texture of the quilt. I haven't washed it yet, but it already has such a great feel. Today is the last day of spring break for us. And while it's been sunny and beautiful all week, today it is cold(er) and rainy. The perfect kind of day to curl up and do nothing. Quilt Finishes at 80" by 90"
Linking up to Finish It Up Friday, Show and Tell Tuesday, and Fabric Tuesday. Absolutely beautiful. When I first started quilting, everyone was into very bright fabrics. 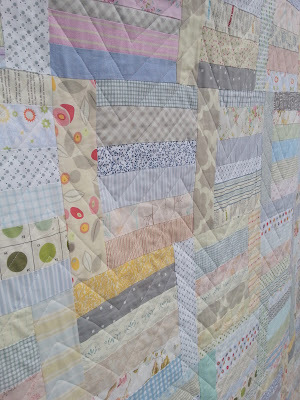 While I didn't have a name for it, the low volume quilts are what I really liked. Beautiful! 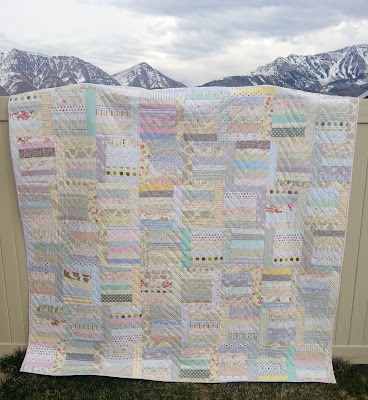 I love the mountain backdrop in your quilt photo also. Pretty. I too want to make this one for the Sunday Morning Quilts. I am sure it will look great on your bed. This is lovely, so calm and restful. Love how you took the last photo! It's gorgeous, Emily! I never thought of putting low volume fabrics together until I saw the one in the book, Sunday Morning. I started one and, like you, found that I had to buy more low volume fabrics (unless I wanted very little variety in the blocks -- and I didn't). I love how you pieced the back, too. Good for you to make a quilt for yourself! Lovely quilt! I like the texture that the quilting has given it and I agree that might be doable on a home machine - something to think about. 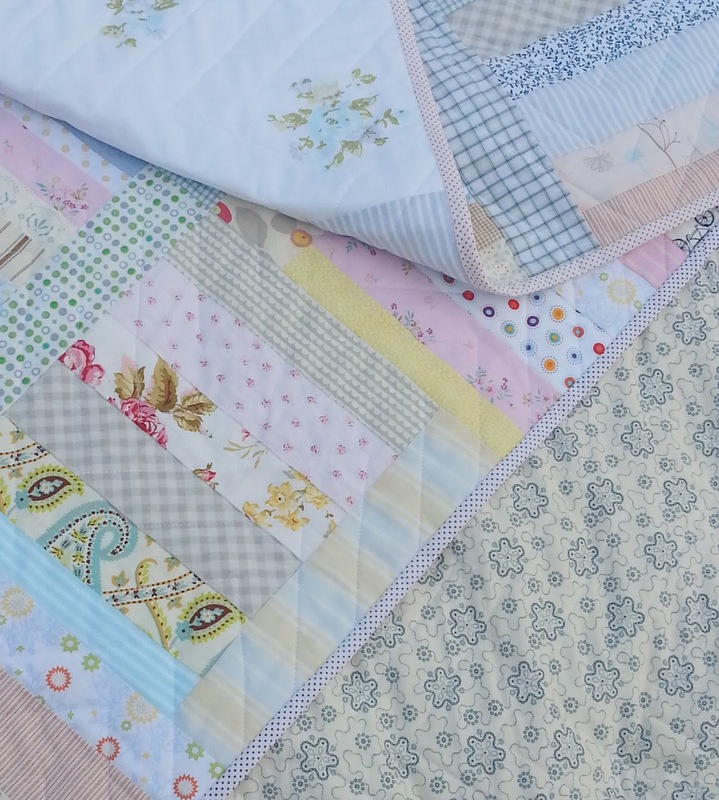 Your low volume quilt is very soothing and calming. Lovely job! What a gorgeous quilt. Love both front and back. It's beautiful. Good you've finally made something for yourself! That quilt looks so soft and so pretty. Very nicely done with all those "lights". And that quilting looks great, too. I might have to try that myself. Looks like it's not very complicated. way to go! your palette is fabulous. i love the low volumes. they are perfect for a bedroom. thanks for showing us! This is stunning, it's got a real romantic 'feel' about it, the colours you've chosen work lovely together - I would have to buy huge amounts to be able to do something similar... I just knew I didn't have enough fabric, I need more (tsk tsk any excuse eh).